EMC has a custom shop sign feature for use on Residences. There are three different versions of a shop sign that are reflected in how they are made and used. However, all of them use the same format. To learn how to buy and sell from various shop signs, visit the Wiki page about using player shop signs. In order to set up a shop, you must first start by placing a chest, trapped chest, or shulker box somewhere. This chest should contain the item(s) you would like to sell (or it will store any items you may be buying). Then, you need to place a sign near the chest - the shop sign. A shop sign can be placed above, directly on top, attached to, or beside the chest. The Remote Shop Sign allows you to have a shop sign far away from the chest that contains the items being bought/sold. There are three different types of shop signs: the hash (#) sign, the CHOOSE sign, and the old shop sign. The old method is basically kept in place to keep things easy on the players, but it is recommended that you use the current system with the hash (#) sign. To finish setting up the shop, grab the item you want to sell in your main hand and left click the sign. It should automatically update to show which item the shop is selling, and give you a message in the Chat that says "Shop successfully created for <item>." Note: You can put the word "FREE" as the buy or sell price to give away (or accept) items for free. The new shop system introduces a new command known as /createshopmode,which allows you to edit the item you are selling without having to destroy the sign. Left-clicking any shop sign you created with an item will change that sign to sell the item in your main hand. Follow the same steps from the regular shop signs - left click the sign with the item you want to sell. 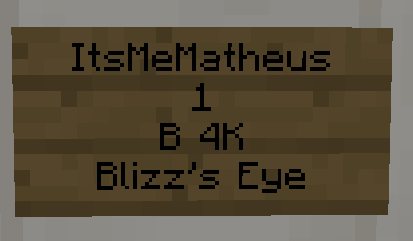 This time, instead of displaying the item name, it will display the custom text you wrote on the last line. After this confirmation message is shown, you need to click the sign again to confirm your purchase. The old method of creating shops is similar the process shown above. However, it is less advanced in that instead of using # on the fourth line, you simply write the item's name or the item's ID. To find this out, type /iteminfo while holding the item you want to sell. Shops created under the old method can still be altered (in what they sell or buy) with the /createshopmode command. With the 2016 Independence Day Update (found here), a new shop sign was introduced to replace the now obsolete SLOT signs. CHOOSE signs should be used when you are selling items that have unique or varying properties, and cannot be sold as the same item, such as Promotional Items and horse eggs with different stats and enchantments. Their other main advantage is that players get to see the items in the chest through a dialogue box/user interface and can click to choose what to buy. You cannot sell items to CHOOSE signs with the :sell mechanism (use the #sign system instead). 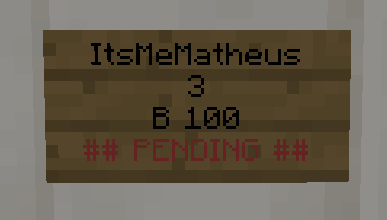 A choose sign where players can buy 3 items at once. Note: On the amount line, you can only set the sign to sell multiple copies of the same item (i.e. the same item ID, which can be found with /iteminfo). To ensure it works, you can test the chest dialog yourself by left clicking on your CHOOSE sign. Note that you can only use the dialogue box, and no transaction will occur if you are the owner of the shop. After players click on an item to buy, a confirmation dialog is shown. Once players click the sign again, the actual purchase is made. The CHOOSE sign dialog is the same as that of a customized shop sign. The first 3 lines of the CHOOSE sign remain the same, but on the fourth line, you would specify the range or the specific slot you want to for the shop's stock to draw from. Using a limited range like this will affect the dialogue box by showing a smaller amount of rows and not displaying any items that are placed outside its range. Note that a CHOOSE sign will first pick an item other than the clicked slot before using the one in the slot itself, even if that other item falls outside the specified range. This behavior is comparable to the old SLOT signs. 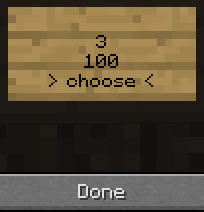 Also, note that the items being sold by CHOOSE signs can be changed to the held item when clicked with/createshopmode activated, just like all the other shop signs. A CHOOSE sign reacts in the same way as the obsolete SLOT sign, with the major difference being the preview that players get before buying. So, if you only want to mimic the old behavior, all you have to do is limit the CHOOSE sign to one slot only. Shop signs cannot be removed by simply breaking them. This is because the sign will think you are attempting to buy from it, or it will think you are clicking on them while using the /createshopmode command to update the sign. Therefore, the best way to remove a shop sign is to hold shift and break the sign.